Let’s not beat around the subject here: Chapter 36 of Fuuka kills off the character the series is seemingly named after. Lead singer of the band Yu and his friends have thrown together, the person who brought them all together and got Yu playing music, his girlfriend, is now dead. It’s something I certainly wasn’t expecting and both does and doesn’t work in the series’ favour. Fuuka’s death means the series has now lost any and all romantic drama that could have been, and her death also means that we spend the next few chapters with Yu struggling to cope with her death. The problem with this is that Yu is only just starting to develop as a character, and while this does help build him up quite a lot in the long run, it also left me feeling a bit disconnected from the story and Yu as a character because I didn’t feel close enough to him to understand why he deals with Fuuka’s death the way he does. It’s certainly a curveball no one could have expected but I’m not so sure it pays off. Ultimately though Fuuka’s death does drive Yu onwards. With the band beginning to fall apart and go their own way Yu stubbornly writes a song of his own in the hopes of winning everyone back, which does end up happening. With the band back together they set about on going pro and going to the highest of places, in part in honer of Fuuka and her dream to see the sights from some high place or another. This dream leads the band into some fairly awkward and tough situations but overall it’s a great deal of fun to experience their journey alongside them which is something Fuuka has always been really good for. The one big problem I have left with Fuuka however is that the series decided to introduce a second character named Fuuka. She’s a lot like the original Fuuka in terms of personality and she also has amazing musical skills, again alike the original. At the moment it seems like she heavily inspires Yu and while although not part of his band yet I strongly predict she’ll be getting involved sooner rather than later. I’d like the series to keep her as someone who both inspires and rivals Yu rather than becoming part of his band and acting as a romantic interest (which again has yet to happen, but I’m fairly sure things are going that way), but sadly it really does seem like a matter of time until they’re all put together. Beyond my small issues with the story however Fuuka continues to impress visually. One of my complaints in my first review is that the lack of actual music in the series because of it being a manga does hinder it, but I’m not so sure that’s a complaint that still holds. Fuuka has really upped its game visually and in a lot of ways I don’t feel like I really need the music to draw me in anymore. Character designs, backgrounds and pretty everything is so well drawn with so much detail that it really isn’t lacking anymore. I definitely still wouldn’t say no to anime adaptation at some point, but it’s not I want to solve problems of the manga anymore. Fuuka is still being released weekly and honestly as long as it can keep up the pace I’m happy for it to continue as long as it wants to. The situation Yu and has bandmates have gotten themselves into is intriguing and if nothing else I want to continue to cheer them on as they work so hard toward their ultimate goal. It had a shaky few chapters with Fuuka’s death but has recovered well. 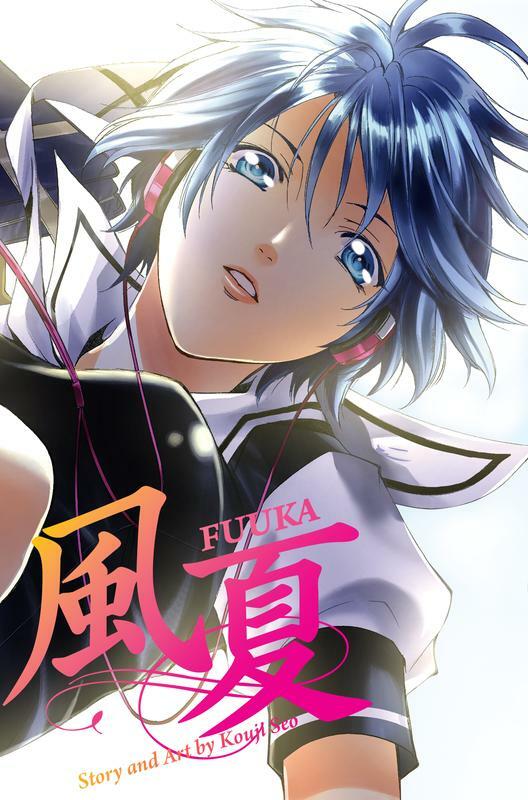 Fuuka is released weekly over at Crunchyroll outside of Japan. The series is 63 chapters long as of this review and while it hasn’t been licensed for a physical release outside of Japan yet I’m hopeful someone will give it a shot at some point.